1781 – Clark’s Grant Land Grant (also called Illinois Grant) provided by General George Rogers Clark and his soldiers for their service in the Revolutionary War for service against the British in the Illinois Country. 150,000 acres divided into 298 lots about 500 acres each. 1796 – James Harrod, Jr. settled in what is Lexington Township, near Lexington. 1799 – Cincinnati Trace built through present day Scott County leading to Vincennes. The road traveled through Leota, Vienna, and Lexington. 1804 – John Kimberlin purchased land near Nabb in what is now Lexington Township. 1805 – Jesse Henley settled at the crossroads of the Lexington – Salem and Bethlehem – Rockford State Roads. 1807 – John & Jacob Stucker settled on Stucker Creek in Lexington Township. 1809 – William E. Collings and friends moved to Pigeon Roost. 1810 – Lexington was laid out and named for Lexington, Massachusetts. It was named New Lexington at the time. The “New” was dropped sometime before the Civil War. 1812 – First blacksmith shop in Lexington owned by Mr. Kanover. 1812 – Pigeon Roost Massacre occurs on September 3rd near present day Underwood. 24 settlers were massacred by a war party of Native Americans (mostly Shawnee, but possibly including some Delawares and Potawatomis). 1813 – Lexington was platted by Colonel William McFarland, Nehemiah Hunt & Jesse Henley. 1813 – Nehemiah Hunt made an addition to the town of Lexington which included the present day cemetery. 1814 – First Post Office in Lexington with Postmaster James Ward. 1814 – Second newspaper in Indiana was in Lexington , The Western Eagle. 1816 – Indiana became a state on December 11th. New Lexington was located in Jefferson County at the time. 1820 – Scott County became a county on February 1st. Sections of all the surrounding counties (Jackson, Jennings, Jefferson, Clark, and Washington) are taken to form the county. It was named in honor of the 4th Governor of Kentucky, Charles Scott. Three townships are created: Lexington, Jennings, and Vienna. Total population of Scott County: 2,234. 1853 – North Austin Platted. 1854 – South Austin Platted. 1863 – Confederate John Hunt Morgan and about 1,800 Confederate soliders travel through Scott County during “Morgan’s Raid” July 10th-11th. Telegraph lines at the Vienna train depot are cut. General Morgan stayed the night at the Beehive Hotel in Lexington before leaving the next morning for Vernon. 1868 – Reno Brother Gang committed one of the first train robberies on May 22nd on the Jeffersonville, Madison and Indianapolis Railroad (JM&I) near Marshfield (between Scottsburg and Austin). Two of the brothers (William and Simeon) were arrested in July and held at the Scott County Jail in Lexington before they were transfered to the Floyd County Jail in New Albany for safekeeping which was thought to be a more secure jail. There, they were lynched by a mob of over 65 people in the stairwell of the jail on the night of December 11th-12th. 1874 – The new Courthouse and Jail were completed and Scottsburg became the County Seat. The offical date the transfer took place is unknown as it was said the transfer took place at night to avoid any civil conflicts. 1892 – Scott County Poor Asylum built at 1050 South Main Street in Scottsburg which houses the Scott County Heritage Center & Museum today. This was the third Poor Farm in Scott County. 1904 – The Pigeon Roost Memorial was dedicated on October 1st. 1907 – The William H. English statue on the north side of the Courtyard was unveiled and dedicated on September 28th at 2:00 p.m. with a ceremony that was led by U.S. Vice President Charles W. Fairbanks and many other dignitaries. Rosaland Orr English, the 4 1/2 year old granddaughter of William H., unveiled the statue that was sculpted by John H. Mahoney. Bands from Lexington, Blocher, and Scottsburg played music for the event. 1907 – The Indianapolis and Louisville Traction Company built a track between Seymour and Sellersburg as part of the interurban line which extended from Indianapolis to Louisville and completed in 1907. First railway in the country to operate on 1200 volt high tension, direct current system powered by generators at the site of present day Lake Iola. 1939 – last train to run on the Interurban line on October 31st. 1960 – Scott County Memorial Hospital opened. 1960 – Interstate 65 officially opened through Scott County. The Scottsburg Service Plaza was dedicated September 26th in a 2:00 p.m. ceremony led by Indiana Governor Harold W. Handley. The high school bands from Austin, Scottsburg, and Henryville provided music for the event. 1964 – Scottsburg changes from a Town to a City. Blake Burns is sworn in as it’s first Mayor. 1968 – Austin was incorported as a Town. The first official Austin Town Board was Hubert Buchanan, Roy Schneck and Gilbert Warner. 1973 – Scott County Poor Farm offically closed and the building was converted into one of the courthouse annexes and would serve as such until 1998. 1974 – One of the worse tornadoes in history, (an EF-5) hit the Nabb and Lexington areas on April 3rd. A young boy was killed after his school bus was evacuated on Hardy Mill Road in Lexington Township. A great deal of destruction occurred to buildings. 1978 – The 1978 Blizzard occurred in January. Schools are closed for weeks. 1992 – After a torrential rainstorm on August 8th, a flood occurs throughout most parts of the county. Many homes and schools are damaged. The southern section of the William H. English Middle School on South 3rd Street in Scottsburg is heavily damaged. 1998 – Remodeling and addition to the Courthouse are completed and dedicated. 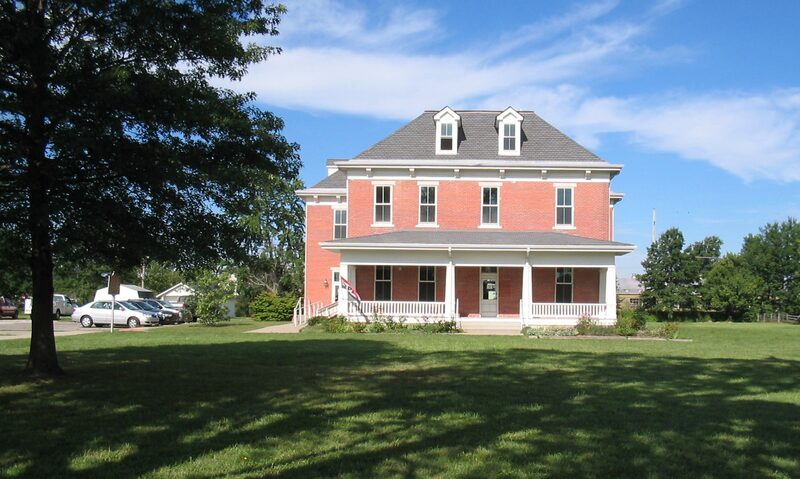 2001 – Scott County Home (Scott County Heritage Center & Museum) placed on the National Register of Historic Places by the United States Department of Interior. 2008 – Austin changes from a Town to a City on January 1st. Doug Campbell is sworn in as it’s first Mayor. 2012 – A EF-4 tornado hit the eastern section of Scott County on March 2nd. A Scott County resident near Nabb was killed. It also devastated towns and communities in neighboring Washington and Clark Counties. Barnes Cemetery on the Scott-Clark County line east of Nabb is heavily damaged.